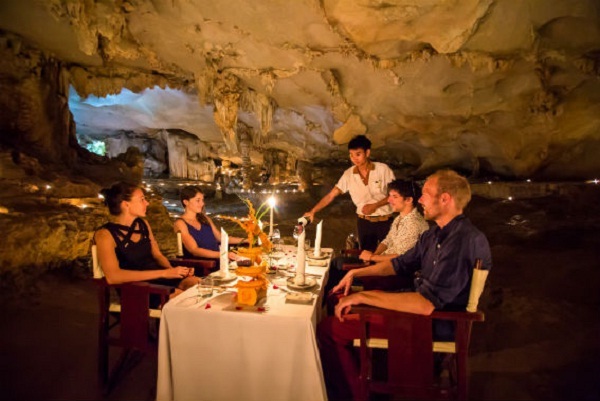 Once paying a visit to Halong Bay, dining in a certain cave is should – not – miss interesting activity for most tourists. However, you only can take advantage of this service at a few cruises. On these trips, you will be served a delicious and delightful diner in the cave by the professional members of crews. This activity is added as one of their included activities by some cruises while as an optional activity by others. After a day of kayaking, swimming or joining in other activities, having a diner in such a quiet, romantic and a little mysterious cave is the most relaxing activity to do. This dinner is often time for their special occasions of many travelers such as a romantic anniversary, birthday party, conference group or even a lively wedding with maximum of 60 guests. In these meals, you will have a chance to enjoy not only fresh Halong Bay seafood specialties but also Eastern and Western dishes to meet demand of both domestic and foreign tourists. 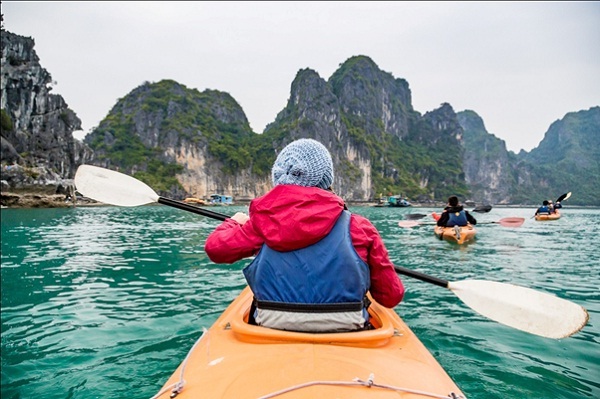 While an excellent way to enjoy the spectacular scenery of Halong Bay at a relaxed pace is on a traditional junk boat cruise, get your paddle out on an off-boat excursion and discover the beauty of the bay up close on a kayaking adventure is an ideal activity for the active among you. Paddle out to the more peaceful, less-known corners of the bay, which the larger boats cannot reach, and explore the hidden caves, distant lagoons, unharmed islands and much more with the detailed instruction of a local guide. Although sometimes having heavy rains or even severe sea storms, Halong Bay might be most spectacular during summer while it has the ideal and cool weather for vacations and holiday in the fall. 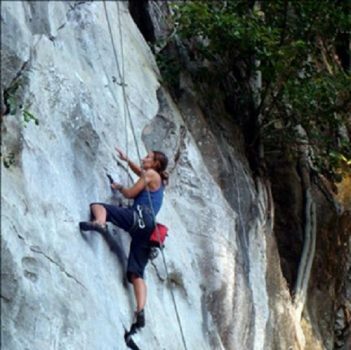 Sunbathe, dining in the cave and kayak between karst limestone outcrops are many interesting activities you should not miss here.